Cherry Hill residents can ‘take a book, leave a book’ at Little Free Libraries. Frequent visitors to Barclay Farmstead and Croft Farm may have noticed the appearance of a colorful, birdhouse-like structure in the last couple of weeks. However, these little houses weren’t constructed to house birds. They were constructed to house books. The library and Cherry Hill Township have teamed up to create Little Free Libraries, small boxes where visitors can take a book for free. Boxes are set up at Barclay Farmstead and Croft Farm. A third box will be erected at Old Orchard Park in the coming weeks. This new program is part of a national system of Little Free Libraries. It operates separately from the Cherry Hill Public Library system of books and allows anyone, even non-residents, to take out a book. “The tagline is take a book, leave a book and that’s what we want to do,” said Bridget Palmer, director of communications for Cherry Hill Township. The idea for Little Free Libraries came from Megan Brown, the township’s director of recreation. She saw one of the libraries at a playground in Florida and thought it would be perfect for Cherry Hill. “We just sat in the playground looking at a couple of books,” Brown said. Brown brought the idea for the program to the library, which immediately jumped on board. They used some of their donations to initially stock the Little Free Libraries. The township and library hope the boxes will be self-sustaining. The community is encouraged to place their own books in the little libraries in exchange for taking a book. “We want to make sure there are books in there. We’re hoping that the public, if they take a book, will eventually bring one back,” said Katie Hardesty, the library’s public relations director. Hardesty said the boxes are not drop offs for books in the library system. They are simply books patrons can grab to read at a park or bring home. A library card is not needed to use the Little Free Libraries. Volunteers will check the boxes every few weeks to make sure they remained stocked. The library is also accepting donations for books. To design the boxes, the library commissioned local artists Bob Minnick and Tracy Steele to do the designs. Minnick works for the library, and Steele’s work was featured at the library in the past. “They donated not only their time and talent, but all the materials,” Hardesty said. Each box has its own look and reflects the Cherry Hill community. For example, Barclay’s box includes the arched windows at the library’s building. “(Minnick) loved architecture and felt it had big historic meaning in Cherry Hill,” Brown said. The township chose some of Cherry Hill’s busiest parks to launch the program. Hardesty added Croft and Barclay were chosen to start the program because of their historical significance. Brown hopes the community embraces the idea of the Little Free Libraries. The library plans to monitor their usage and possibly expand the program to other township parks. The library is encouraging residents to document the time spent at the Little Free Libraries. 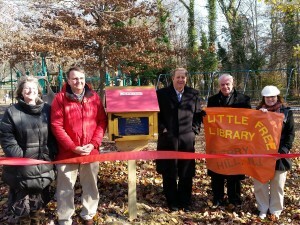 Patrons are asked to post their activity on social media using #littlefreelibrary and #lflch.